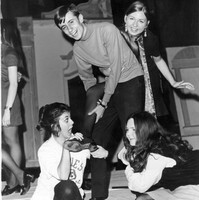 A group of theater students play around in 1970. 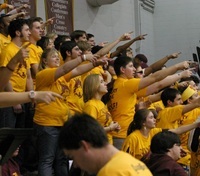 A section of Rambler Rowdies cheer Loyola's Men's basketball team as they beat Purdue on December 11, 2005. 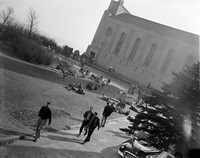 Loyola Chapter of Alpha Sigma Nu, 1938, the first year of the chapter's establishment, from the 1938 Loyolan. 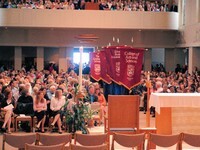 Participants in the Blue Key Induction Ceremony, from the 1983 Loyolan. Members of Loyola's Blue Key Honor Fraternity during the chapter's first year in 1926. 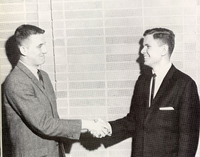 Past and present presidents of the Blue Key Honor Society, Jim Fletcher and Ed Bough, shake hands in an image from the 1965 Loyolan.